A Limited Edition fine art print by Peter Deighan. Marvellous portrait of the charismatic Irishman, Eddie Irvine, who was one of the sport's most exciting and uncompromising stars. 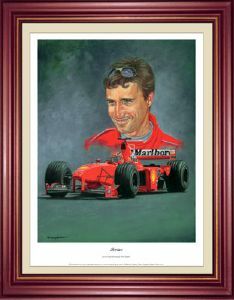 With Ferrari he was without doubt one of the biggest draws to the sport. Brilliantly featured here by artist Peter Deidhan, Published in a limited edition of 500 copies. Approx. Paper Size: 32 x 38cm, 12.5 x 15 inches. Please note, our price is for the unframed, limited edition print.